Due to an event last weekend, I stayed at the Hotel Central-Classic on Hasenbergstraße in Stuttgart. Jens had made the booking on the basis of the many positive reviews as well as its central location. Check-in was smooth, fast and friendly; the room was really not to my taste, because the bed was definitely too short. Since it was in an alcove between two walls, I had to sleep with my legs pulled in, something I hate like plague. Otherwise, the room was very simply furnished and not all that big, but it was clean. The mini bar was also sufficiently filled with drinks and the prices were okay. What I really liked was the well-functioning, free Wi-Fi. If you don’t happen to have a device with you, you can always use the internet terminal in the lobby. As you can see in the picture below on the bottom right, the set-up is not exactly ergonomic, but at least they offered something. And yes, we had a tonne of fun in the middle of the night when Jens volunteered to be the guinea pig. The breakfast room is simple but nice and the buffet clearly arranged. The star at breakfast was the coffee which was quite good, while the rest of the food seemed like it was from the local discount shops. 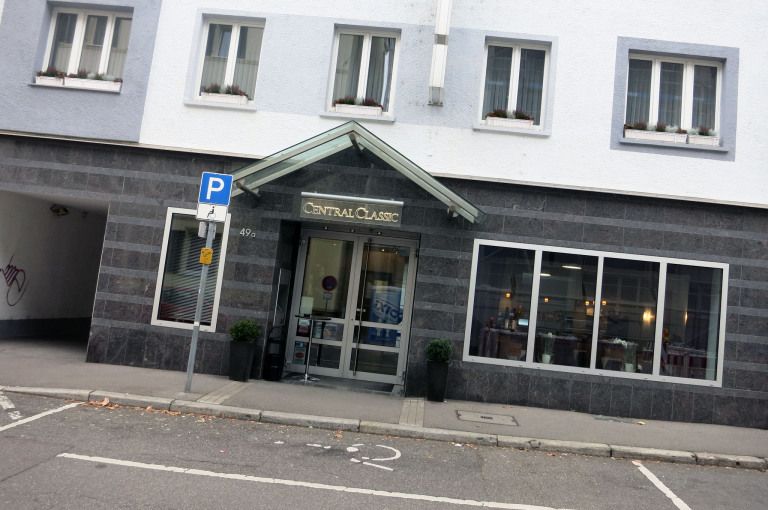 Overall, you can spend a decent enough night at Hotel Central-Classic Stuttgart, but I think the price of €79 per night was a bit excessive for what I got. 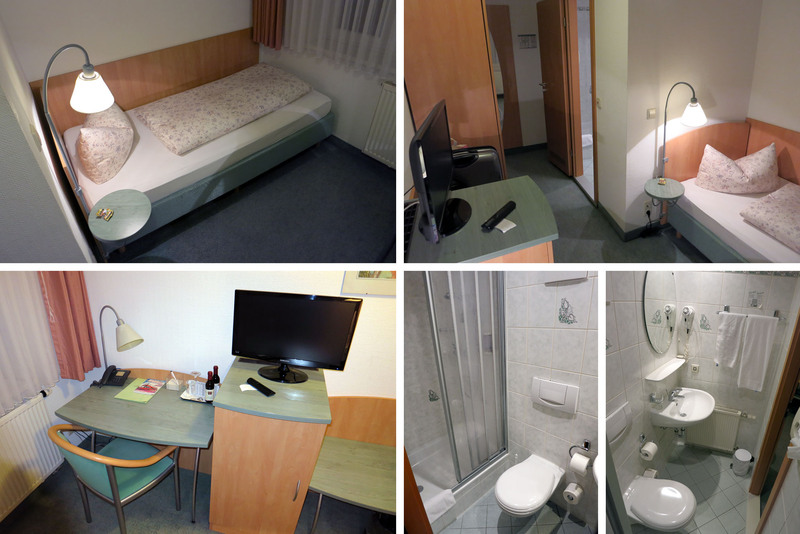 There are cheaper and better accommodations in central Stuttgart (such as the Hotel Wartburg). But the main reason why I will probably not return is the way the bed is wedged between two walls, as described above. So you can get a better impression of the rooms, here are 360° panoramas of my room, the bathroom and the breakfast room via Thetanaut. 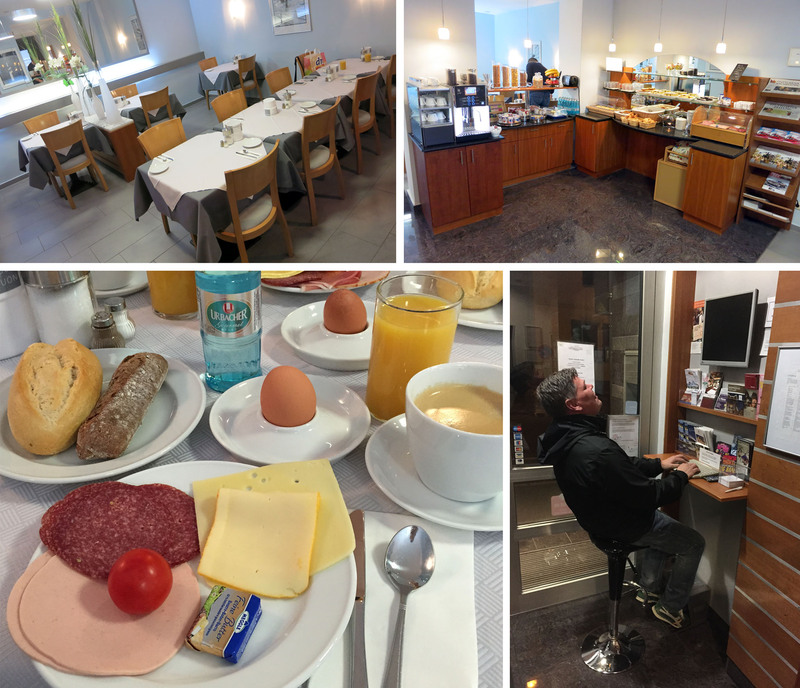 Christian and Jens, who joined me that weekend, have also written posts (in German language) about the hotel.